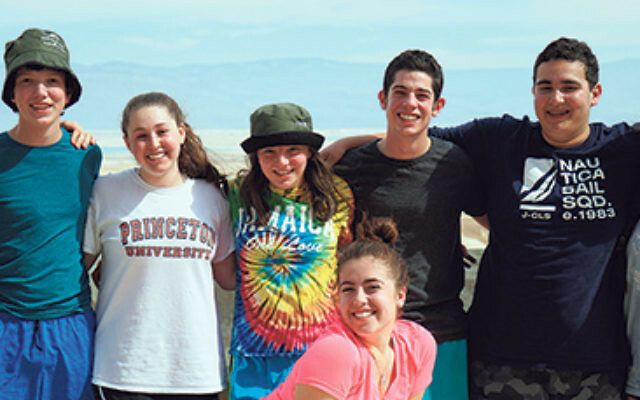 At the base of Masada are NJ teens participating in the NFTY-EIE High School in Israel program, from left, Nate Perlmeter, Isaac Hart, Erika Lilienfeld, Zoe Dressner, Jacob Feldstein, Stephan Rosen, and Samantha Saunders; in front, Iris Hirsch. Eight teens from New Jersey are part of a cohort of 63 North American high school students participating in the four-month NFTY High School in Israel-Eisendrath International Experience program. The students, Stephan Rosen and Samantha Saunders of Temple Har Shalom in Warren, Erika Lilienfeld of Temple B’nai Or in Morristown, Nate Perlmeter of Temple Ner Tamid in Bloomfield, Iris Hirsch of Temple Beth-El in Hillsborough, Isaac Hart of Barnert Temple in Franklin Lakes, Zoe Dressner of Anshe Emeth Memorial Temple in New Brunswick, and Jacob Feldstein of The Jewish Center in Princeton, are taking part in a semester-long intensive academic program for high school students in grades 10-12 based on Kibbutz Tzuba. Students study Jewish history and take part in a Hebrew ulpan in addition to fulfilling their home high schools’ general studies requirements. They also go on tiyulim, or field trips, and engage in week-long trips throughout the semester, including a trip to Poland to study the Holocaust, a week in Gadna (a simulated Israeli army training experience), and a sea-to-sea hike across the country. Registration is open for EIE’s summer 2016, fall 2016, and spring 2017 sessions. For information, visit nftyeie.org.